I'm not sure if my XRR fits the category, but she is my current Adventure bike. I use it mostly for single day outings and prefer to play race on fireroads, but it will also handle tight single track, though it is more work than my KTM 250. It is plated and I think it is the best big dual sport combination of light weight, good power, and reliability. It has mild engine mods and put down about 52HP at the rear wheel. I also have a Rekluse auto clutch and rear hand brake, which I think are some of the greatest accessories available. We won't turn you away Pete! 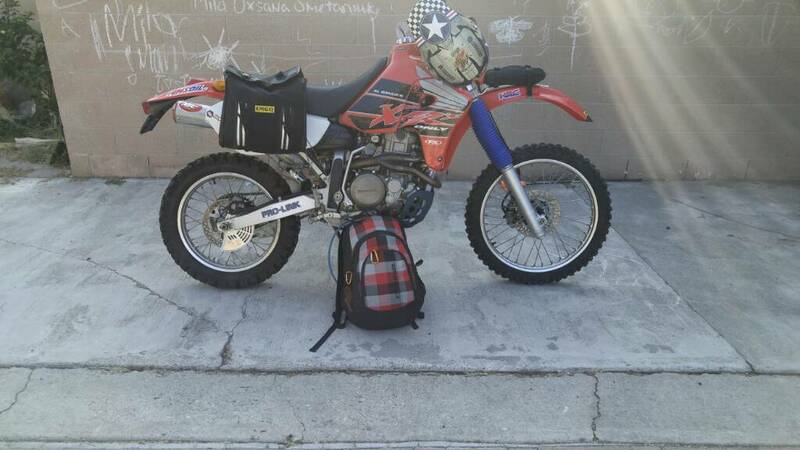 Technically your bike is refered to as a BRP (Big Red Pig), so that's close enough to XL for us! Nice looking bike and the Pac NW scenery is beautiful. I really miss the one I had! It was stolen from the back of my truck when I still lived in Phoenix. enjoy, and I wish I had it still for weekend trips etc. Too bad Commifornia makes it impossible to register one here now if it's not already plated. I always liked the XRR. Out of curiosity, tho: Why Big Red Pig? I can figure out why Big and Red, but pig? It's a much slower handling(compared to 400cc bikes) and also no pumper on the carb. So you roll in the throttle and it's like a big diesel that keeps building speed vs an MX bike with a pumper that has a more explosive hit. I thought Big Red Pig was reserved for the L series? The L definitely has a CV carb, but I'm pretty sure the R has a round-slide pumper carb. The two bikes can't really be put in the same class. The R is a much more formidable beast than the L is. Regardless...I love my 650L, best bike I've owned! With a few basic mods you can start to narrow the gap between the two models considerably. While the R is a much more go fast oriented bike the carb is not a pumper :thumbsdown: although I would probably have crashed mine a LOT more if it were. you can retrofit a pumper type carb with some searching though. Edlebrock makes one for this bike, Mikuni has a pumper through XRs only, and a few other bikes can be swapped if you want the pumper. Put the Kenaroo Dakar fairing and Acerbis 6.3 tank on mine. Now I have about 250 mile range and it still handles about the same, just feels a little weird. The 650R is only kickstart right? There is no electric start option? You can get the 650L with e-start, "L" for Ladies model! Used to have an 650L. It was a good bike. Uncorked, exhaust, new jets, and 13T sprocket up front and it was a blast. Got 25 MPG though. =(. Added some decals to the bike in honor of the race going on right now!